What Is The Most Surprising Car You've Ever Driven? As car lovers we like to think we have a good idea what's going to happen when we hop into a car we've never driven before. Whether it's a pre-conceived notion about how truly terrible a car is or expected automotive euphoria behind the wheel of a car we've always lusted after, even if we don't think we know it all we know more about what to expect behind the wheel than the hordes of non automotive obsessed individuals. This weekend we want to know about the time you got behind the wheel of a car and experienced something you wouldn't have expected. Maybe you were blown away by a car you never thought you'd like or perhaps you were disappointed by a car you always knew you loved. Either way, we want to know what car gave you the biggest automotive shock you've ever received and why. What is the most surprising car you've ever driven? 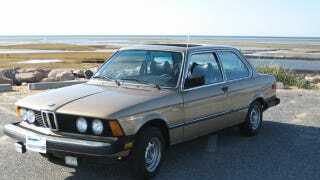 The biggest automotive surprise I ever got was when I test drove the 1980 BMW 320i that followed me home shortly thereafter. After some time spent traveling I returned home in the middle of a New England winter at an all time car ownership low of one vehicle, my 1957 Plymouth, which was long tucked away for winter hibernation. I had my heart set on buying an E28, but finding a half decent one in the middle of winter proved to be more of a challenge than I had initially anticipated. I came across a very ratty 1986 535i a couple hours away from home that I had decided would be perfect, but just in case it wasn't I set up an appointment to look at the—for my V8 and large inline six driving younger self—grossly underpowered 320i. Long story short, the 535i was more beat up than I could have imagined and my test drive in the not-too-rusty 320i through the hills of Western Massachusetts taught me the valuable lesson that a car doesn't have to be fast to be a whole lot of fun—truly a very welcome surprise.